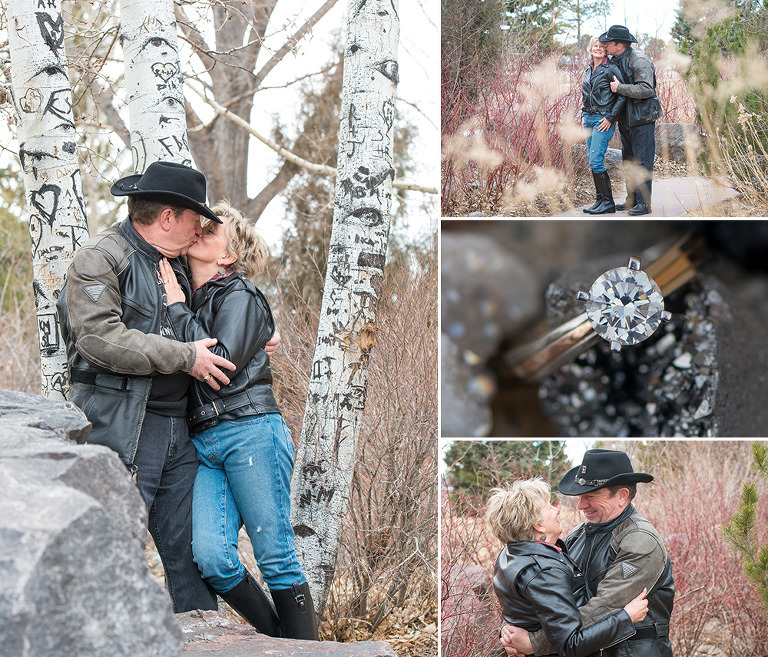 As a team of Cheyenne photographers we work together to pull off some pretty amazing imagery, this is evident in R+S engagement at Cheyenne Botanic Gardens. We recently discovered this hidden gem located near Cheyenne Frontier Days and I have to say we love it for photos. It’s almost like they built it with the Wyoming photographer in mind, it has everything right there in one central location. It has that picturesque feel of the mountains yet we were only ten minutes from downtown Cheyenne. This photo of the engagement ring is beautiful but to see it in person was like wow! Ron picked out a lovely brilliant cut engagement ring for his bride to be. These two just cuddling at the Cheyenne Botanic Gardens, their wedding is only two months away! Happiness is when we get to capture the love between two people and they are complete rock stars at modeling! While their session only lasted about 20 minutes because of the blistering cold wind of our lovely, Cheyenne, you would never even know they were slightly frozen. They kept each other warm just cuddling and laughing. No idea what they were talking about but it was perfect to get these great shots of Sherrill and Ron so in love. Being a Cheyenne photographer is awesome because of all the different weather elements Wyoming can throw at us in less then minutes. I say, ” Bring it Wyoming!” When the weather turned on us so fast, we had to move quickly to get some cute photos of this biker couple on the Harley. Braving the Wyoming weather was well worth it because their engagement photos on the motorcycle are some of my favorites ever. We instantly connected with S+R during their Cheyenne engagement session because they met online just like Jonathan and I did (9 years ago, omg). Like us they got engaged in weeks and the rest is history. What is the sense in waiting around when you know you find your soulmate? Right? You can tell Ron is a true Wyoming native wearing his cowboy hat with US Army pin and Sherrill looking beautiful with her matching leather jacket and riding boots. What they wore to their engagement session was perfect, it was a true reflection of their personalities. While you don’t have to be fancy to be photographed, you just have to be in love. 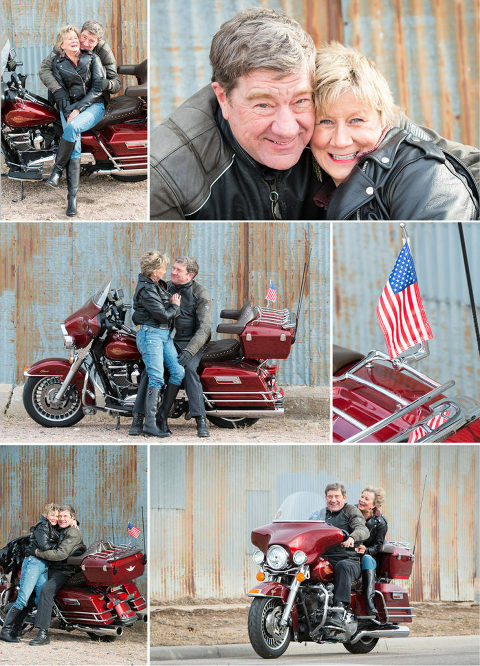 Cheyenne engagement session on a Harley Davidson. We are so looking forward to being their Cheyenne wedding photographers at the Cheyenne Little America Hotel. Cheyenne is one of our favorite places to shoot weddings because we love the small town feel and the city is absolutely gorgeous. Their historic wedding venue is will be the perfect setting for R+S Cheyenne wedding. 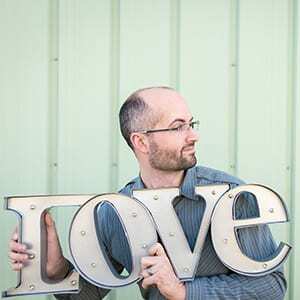 See their wedding highlight blog here! !